Join two heroes on one grand adventure! When fate brings a clipper carrying a curious naturalist and a pioneering geologist to Tapa-Tui, Hika-Ri and Kao-Ri embark on an all-new journey to explore the many wonders of the island paradise and uncover the culprit behind a despicable plan to strip it of its precious resources. From vibrant jungles bursting with color, to an underwater wonderland teeming with aquatic life, to a cluster of floating islands, you'll traverse many magical lands filled with jaw-dropping miracles. 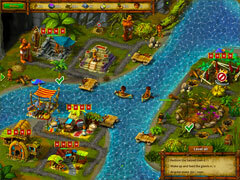 You'll also go toe-to-toe with awesome giants, outwit clever jellyfish and pet cute Manu-Ai to receive mana. Characters that range from the charming Posei-Don to the wicked Moko-Moko lizards will make each encounter a memorable one. Along the way, you'll race to complete 80 thrilling levels that challenge you to strategically figure out the best use of your resources. Mine stone and ore from the bowels of the Earth, summon crops from fertile soil and trade with merchants, all in an effort to complete missions ranging from keeping an island afloat to repairing a natural cloud maker. 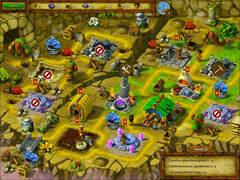 Smart use of relics that grant various abilities and production bonuses will ensure your success. 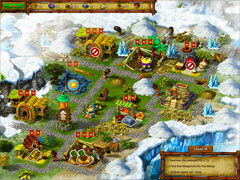 Complete your tasks swiftly and reap dozens of awards or play the game at a leisurely place – it's up to you! Either way, a sense of awe and discovery will pull you through the epic storyline to its exciting conclusion. Guide Hika-Ri and Kao-Ri on the adventure of their lives and enjoy countless hours of fun on the enchanted island of Tapa-Tui!